Drinking less than half a glass of alcohol an hour is enough to suppress the functions of the frontal lobes which control your inhibitions, self-control, willpower, ability to judge and concentration.This effect can be detected at a blood alcohol level as low as 0,01 g/100 ml, which is easily reached by drinking less than half a glass an hour. Next in line to experience the alcohol wave are the parietal lobes at the sides and on the top of your head. When your blood alcohol level is about 0,10 g/100 ml (typically after two to three drinks an hour) your motor skills are impaired. Your speech may be slurred but funnily enough you don’t seem to notice. When the alcohol reaches the back of your head and the occipital lobe your blood alcohol level will be about 0,15 g/100 ml. By this time you’ve had four to five drinks (or two to three doubles) in an hour. Your intoxication level is becoming quite dangerous even though you might not think so. 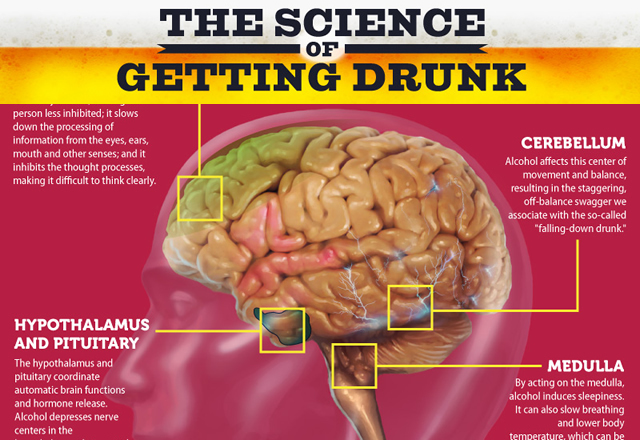 When your alcohol level reaches 0,2 g/ 100 ml (after four to six drinks or three doubles in an hour) the alcohol wave is crashing over your cerebellum. By now your balance will be severely affected and you’ll have trouble standing. Hopefully your friends have already seen to it that you’re lying down safely so you can sleep off the backlash of the booze. If you’re not in bed by now you’ll be lying somewhere in a drunken stupor. Your blood alcohol level is in the region of 0,25 g/100 ml and your midbrain has become affected. You’re paralytic, jittery and nauseous and your reflexes are severely impaired. If you drink four doubles an hour your blood alcohol level will quickly exceed 0,35 to 0,4 g/100 ml. With this amount of alcohol in your body your brain will be hit with a vengeance. It’s now a matter of life and death: if the alcohol reaches the medulla oblongata (the part of the brain controlling breathing and blood circulation) you can die.